Lorna offers a wide range of workshops about Respect, Bullying Prevention, Conflict Resolution Skills, Stress Management, and Emotional Intelligence. She works with adults who work with children – teachers, parents, school councils, mental health professionals, coaches, and camp counselors. Lorna also mentors teens and young adults in the Girls’ Respect Groups Program. Lorna lives in Toronto, Canada and gives workshops and presentations in North America and internationally, upon request. Contact Lorna for more information. Despite thousands of prevention programs, why is bullying still on the rise? This workshop will change your understanding of bullying! We’ll look squarely at the factors encouraging bullying’s insidious growth & our incremental acceptance of bullying as the new norm in our homes, schools, & communities. We’ll examine the contributors – escalating levels of everyday rudeness, reality shows that demean & humiliate, & the unwitting role that adults play in enabling & teaching kids to bully. We’ll discuss all 3 bullying roles – the bully, the target & the bystander & why any solution to bullying must address all 3. Bullying is an adult problem, not just a kid’s problem. Even the most experienced, empathic teachers have trouble spotting bullying. This lively, interactive workshop trains teachers & other professionals to recognize the subtle signs of bullying & how to identify & change toxic environments that provide fertile ground for bullying to grow. You’ll learn why conflict resolution skills don’t work for bullying, why cyberbullying is always just the tip of the iceberg, & the critical responsibility of bystanders. Small group case studies, videos, written classroom exercises, & video games give teachers a wealth of knowledge to take back & share with their colleagues & students. The biggest online risk to our students is from their own behaviour! Go live to the websites your students use and learn how to enable privacy settings to optimize safety. Engage your students in discussion and action! 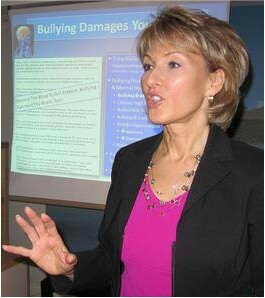 Learn how to teach your students about bullying, without adding another teaching unit to the curriculum! Where does acceptable online behavior end & cyberbullying begin? How can adults get a handle on kids’ technology? What are the symptoms & what are the solutions? How can we teach kids appropriate boundaries & limits? And what about adult cyberbullying? This workshop can be done with a live Internet link to walk adults through a child’s online world. Join us at this lively, interactive workshop for elementary teachers. Using children’s books, games, & classroom activities, we give teachers tools to support classroom goals of empathy, respect, & acceptance for all. You’ll come away with immediately useful resources & ideas for simple things you can do in your own classroom, without adding extra lesson plans! For parents of children ages 3 to teens. Money management is a key life skill. Helping out around the house encourages kids’ sense of contribution to community and fosters their self-respect by building competence and confidence. Do you pay your children for chores? Do you give your child an allowance? How much? When to start? Who pays for CDs, gifts & clothes? Help your child develop the skills for living on their own – believe it or not, by age 5 your child is starting to learn these skills. Come to our workshop for a lively discussion & form a framework for your family!